During the Central Europe Chiefs of Defence Conference held on 29th March the Supreme Allied Commander Europe General Curtis Scaparrotti has praised the Czech Republic for its military modernisation plans - The Nordic Fires 2019 exercise has started at the remote Vidsel shooting range in northern Sweden - On 3rd April the Czech Police has handed over two Iraqis arrested on terror charges to their Austrian counterparts - Czech Army has received five new recovery vehicles to support the Pandur II wheeled infantry fighting vehicles - The Director of the Security Information Service Michal Koudelka received the George Tenet award. During the Central Europe Chiefs of Defence Conference held on 29th March the Supreme Allied Commander Europe General Curtis Scaparrotti has praised the Czech Republic for its military modernisation plans: “The United States and NATO are fortunate to have committed and capable allies like the Czech Republic. As Allies we must continue to work together to ensure we remain ready to face current and emerging threats,” Gerneral Scaparrotti said. “The United States and the Czech Republic are stronger together through our joint service in operations, combined exercises, through our shared education programs, and through our military exchanges.“ The Chief of General Staff General Aleš Opata said Czech Republic will fulfil the pledge made years ago to increase the defence spending to 2 percent of GDP by 2024. 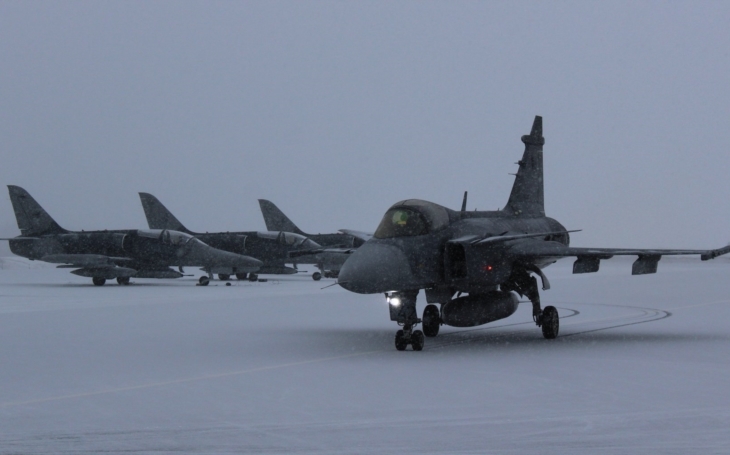 The Nordic Fires 2019 exercise has started at the remote Vidsel shooting range in northern Sweden. The Czech airmen with four JAS-39 Gripen fighter jets (211th Tactical Squadron) and three L-159 ALCA light attack jets (212th Tactical Squadron) are training live fire at air targets with both the cannons (27mm Mauser BK-27) and the air-to-air missiles (AIM-120C-5 AMRAAM and AIM-9M Sidewinder), and the low level flights, which they are not allowed to train in the Czech Republic. On 3rd April the Czech Police has handed over two Iraqis arrested on terror charges to their Austrian counterparts. They were both arrested at Prague airport a week earlier, upon warrant issued by the Austrians: both Iraqis (a man and a woman) are wanted over terrorism charges, and are supposed to be members of the same terror cell with an Iraqi man arrested in Vienna after his unsuccessful train attacks in Germany. In one of the attacks a high-speed train hit a steel wire stretched across tracks between Nuremberg and Munich. Czech Army has received five new recovery vehicles, based on Tatra 815 V8x8, to support the Pandur II wheeled infantry fighting vehicles, LAVs Iveco and Dingo or the T-815 and T-810 trucks, for both the homeland and foreign deployments. New vehicles will replace the AV15 recovery vehicles designed in the 1970’s and produced during the 1980’s. The Director of the Security Information Service (BIS, Czech counterintelligence service) Michal Koudelka received the George Tenet award at CIA headquarters in Langley, Virginia in early March, media reported on 4th April. The award can also be seen not just as an apprecation of the high level of international cooperation and good results by the BIS, but also as a sort of answer to the Czech President’s criticism of the agency’s work. Miloš Zeman has twice refused to promote Michal Koudelka to the rank of General.